All Aboard the USS Awesome! I passed a milestone last week. I turned 30. Most people are horrified when this happens, but, having felt more like a grandmother than a twenty-something for the last decade, I’m really excited. I know, I know — age is just a number. But, as a math geek, numbers are one of the things I put stock in. And how about these numbers? My birthday is on March 2. This year, the numerical date of my birthday was 3-2-10. Read each digit out: “three, two, one, zero”… It’s a countdown! So, I decided that since my birthday was already a countdown, I would have to countdown to something… I already knew I wanted to have a big party for my birthday with some kind of theme, so I thought I would have a “launch” party — a 3-2-1(-)0 BLAST-OFF! like when they launch a ship. 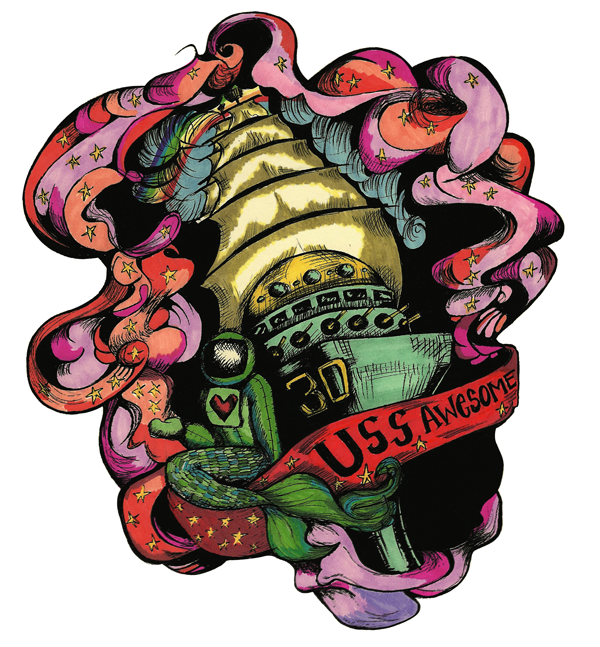 I had conceived and named a fictional ship many years ago (don’t ask why, I don’t know…) — it’s called The USS Awesome. It’s half space ship, half pirate ship, half battle ship, and half cruise ship. And there is only one word to describe it: AWESOME. 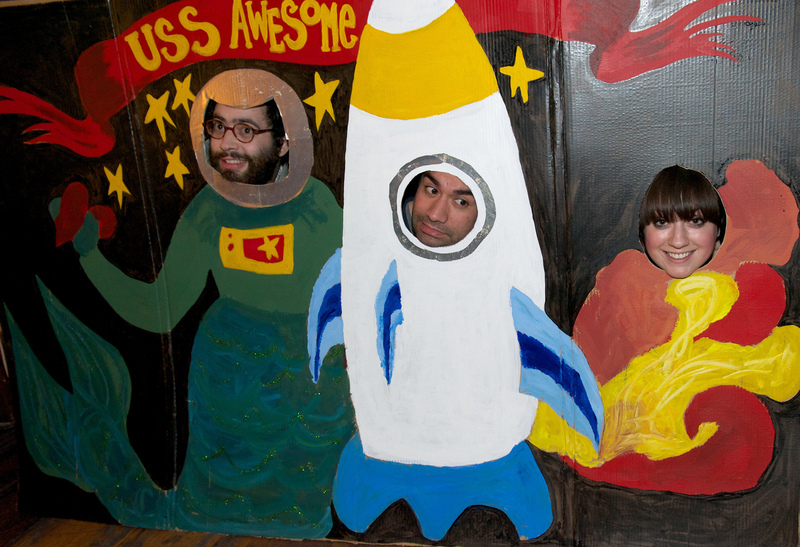 It’s the kind of ship that deserves an awesome launch party, so, the theme became the USS Awesome. And since I wanted everyone to really feel the theme and have an awesome time, I enlisted a little help from my friends to make some awesome things. First, we needed an invitation. So, with the help of Corrine and her little toy collection, we made an artist’s rendering of the USS Awesome and a video invitation. We shot everything using the built-in camera on her laptop, and I edited everything and added text using iMovie. When it’s this easy, and everyone does Facebook or eVite invites to everything, why not make a video invitation? Most awesome party favor ever! They were a big hit. I especially liked them because I put them on everyone, and that meant that I got to spend a minute or two with every guest, which never happens at your own party. It also helped identify party guests at the crowded bar we were at, so mingling was made easier. It was awesome listening to people decide where to put it on themselves (necks were the best!!) and, best of all, it made for some awesome pictures. I really wanted some awesome pictures from this night. One thing I learned in my twenties is that if you want to have a good time, drink whiskey; and if you want to remember that good time, take pictures. So, Rebecca (pictured on the right below) and I had a few of the gals help us create a really cool, in-theme Photo-Op for all the guests. It was so awesome that people at the bar who weren’t a part of the party wanted their picture taken in it, too. Happy Birthday Alyssa. You are definitely Awesome!